FCGives Marathon Fundraiser Starts NOW! Home > FCGives Marathon Fundraiser Starts NOW! ©2018 Robin AF Olson. 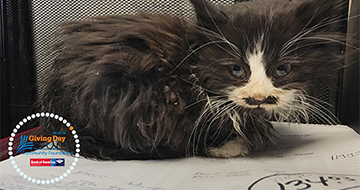 Pistachio was found inside a truck engine with a frostbitten tail. He had a huge bloated belly full of parasites, but was skin and bones under all that fluffy fur. He's our first rescue of 2018. It's Midnight, March 1, 2018. Fairfield County's Community Foundation  Giving Day is here! It's a marathon fundraiser where local non-profits go head to head to compete for a chance to win up to $20,000 in prize money. How does Kitten Associates stand a chance to win? We need YOU! The non-profit with the most DONATIONS in a single day wins. 1. DONATE $10 or more (more is good!) use THIS SPECIAL LINK ON FCGives  between now and 11:59 PM EST. 2. TELL 10 of YOUR FRIENDS TO DO THE SAME. Sharing this post can dramatically improve our chances! Stay tuned to our Facebook Page  for updates throughout the day. Your donation IS tax-deductible. Kitten Associates is a 501c3 non-profit, award-winning, 100% volunteer, home-foster based cat rescue located in Sandy Hook, CT.
Know that every dollar matters and makes a huge difference to our rescue efforts. The other cat rescue in town closed in December 2017, so we're ramping up to pick up the slack. It's going to be a busy year. We hope we can count on your help. Thank you for being part of our team!